There hasn't been much innovation at Coca-Cola to make the brand relevant to millions of consumers, and that spells trouble for the beverage giant. Coca-Cola (NYSE:KO) has gone as flat as a can of day-old soda. Shares of the beverage giant are down almost 10% since the high of $44 it hit back in December, and with seeming few ideas about how to reignite growth in its primary soda business, the chances of them bouncing back don't seem encouraging. In fact, there appears to be little reason to think the stock won't fall further and below are three reasons why this just might happen. 1. Continued focus on short-term solutions. Coca-Cola's first quarter earnings looked pretty good as revenues came in ahead of analyst expectations, rising to $10.7 billion and generating per-share profits of $0.48, also above what Wall Street was expecting and what it produced a year ago. However, much of the benefit was the result of 3% global price hikes the beverage company initiated a year ago as it saw an improved economic landscape. It's also in the midst of a scheme it launched last October to save $3 billion in annualized savings by 2019. But price hikes and cost-cutting only goes so far, and does nothing really to rebuild its drinks business. Instead of looking for the new breakout product, managers are incentivized to be stingy. Wintergreen Advisers thinks Coke needs to be bold now, not timid; on the attack instead of sitting back and playing defense. They've advocated Coca-Cola initiate a "transformative strategy" like H.J. play for Kraft Foods. CEO Muhtar Kent, though, doesn't seem to be thinking big enough and looks all too willing to fight a rearguard action as it covers its retreat in soda. 2. New products fail to catch on. One area where Coca-Cola does seem to be finally thinking outside the box is in partnerships, such as the near 17% stakes it's taken in Monster Beverages (NASDAQ:MNST) and Keurig Green Mountain (UNKNOWN:GMCR.DL). Unlike rival PepsiCo (NASDAQ:PEP), which offers diversity through its Frito-Lay snack foods division, Coca-Cola has been beholden solely to its beverage business, and though the two partnerships don't really change that, it's at least expanded on the notion of diversifying the risk to others. The problem is the path it has chosen is risky. The new at-home cold beverage system from Keurig still seems too reliant on soda, which remains in a secular decline, and its partner may have botched the rollout, giving rival Sodastream International (NASDAQ:SODA) a small window of opportunity to steal its thunder. Sodastream will be releasing its own, updated appliance later this year. And though energy drinks are a popular, growing category, concerns about their health risks may ultimately sink the drink. Monster itself has been hit with several lawsuits following deaths after drinking its beverages. Coke's other foray beyond soda is curious in that it seeks to cash in on the protein craze, but uses premium milk as the vehicle to carry it. Milk, like soda, is suffering from declining consumption and asking people to pay more for something they're already drinking less of seems misguided. 3. Soda volumes fail globally. Most of Coca-Cola's problems with soda are in its domestic markets, where almost half its annual revenues are derived. Overseas it's still able to notch growth in sparkling beverages. Unit case volumes were up 6% in the Asia-Pacific region, were 4% higher in Eurasia and Africa, and were flat in Europe and Latin America. Critics at Center for Science in the Public Interest savage Coca-Cola's classic "Hilltop" commercial with song that could continue changing people's perceptions about the value of soda. But net operating revenues were down in most markets, though that was primarily because of the strong U.S. dollar. Even so, operating income was down in all those markets too, except Europe where it was flat. Unfortunately, the markets where it's still seeing volume growth are among Coke's smallest, meaning the gains aren't going to move the needle and it still faces the risk of seeing more consumers turn away from soda. Until it's able to reenergize its brand globally, let alone domestically, Coke will have that hanging over its head. Coke is nowhere near a busted company or investment, it's just one that has failed to respond appropriately to changing consumer tastes, or has reacted too late. Management isn't willing to use bold strokes to alter its course and prefers playing it safe while nibbling around the edges. 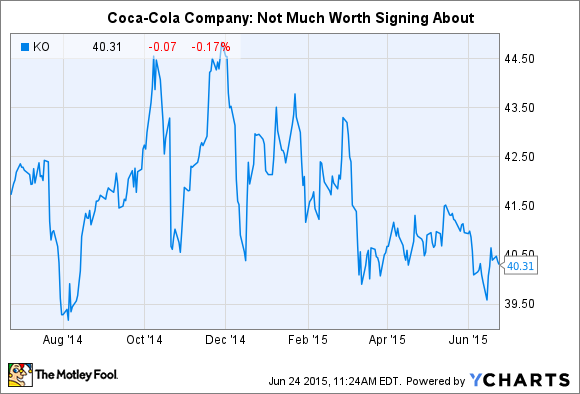 That suggests Coca-Cola's stock might not only stay flat, but could yet fall.